Welcome to my Java Recursion tutorial. 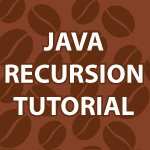 In the video below, I’m going to cover java recursion in 5 different ways. I figured if I show it using many different diagrams that it will make complete sense. A recursive method is just a method that calls itself. As these calls are made the problem gets simpler until you reach a condition that leads to the method no longer making calls upon itself. This is known as the base case. The video and code below will make recursion easy to understand. I also cover the Merge Sort. Can i get your personal email id.. I have tons of questions. but they all are different or not just related to one technology so dont want to ask here and deviate the topics. It will be of great help if i can get your email so that i can mail you as and when i get a doubt. and i am sure the doubts will be of standard industry problems, and then you can elaborate to others. Just curious to know if you have any plans of making some tutorials on Web Services. Thanks Derek your tutorial is such a great help, I have started implementing these concepts in my Automation code . I am experimenting with permutations and combinations using recursion and I was wondering if you could show an example on how you could display all the combinations according to the permutations. I seem to have quite some difficulty doing this. I’ve done some extensive research, but all to no avail. Most of which simply explains the basic concepts of recursion. Hope you could help, and that this would help anyone else searching up the same topic. Have you seen this permutations in java. Thank you, Derek! You’re brilliant! I don’t know how I could have missed this. Very nice explanation. But I would like to see Merge Sort in detail just like you did for Quick sort. It took long time for me to understand how exactly it runs. These 2 sorting algorithms are very important and complicated too. So please if possible prepare a separate video to explain Merge Sort. It would be really helpful for people like me. Your videos are really amazing and helping me to prepare for interviews. Thank you so much for preparing these. Thank you for the nice compliment 🙂 I cover the Merge Sort here. Yeah I saw this video, but I meant a separate video. Anyways, no problem.